When I say that I make my own toothpaste I guess a more accurate description would be tooth clay or powder. Now, I know that it probably looks a little weird, especially if you’re used to buying ‘normal’ toothpaste. For me the first time I made my own toothpaste it was more out of desperation than a health decision. You see, I’d been using a brand called Sensodyne for years because I had really, really sensitive teeth. I’m not talking about can’t drink cold water type of sensitive, I’m saying that I couldn’t open my mouth on a cold day to breath without my teeth feeling like they were going to shatter in my mouth. It hurt! 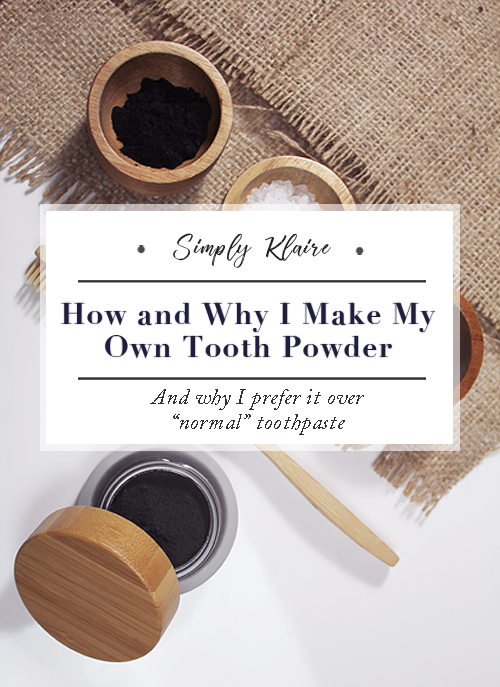 It was only once I got into oil pulling a few years ago and noticed a massive difference to my teeth that I decided to experiment with making my own toothpaste, after all, if I was going to swish coconut oil around my mouth for 15 minutes then using clay to clean my teeth was not that much stranger. I’m not exaggerating when I say that my tooth sensitivity went away in a week. A week! Fine, that might just be my very lucky experience, but that was massive to me. 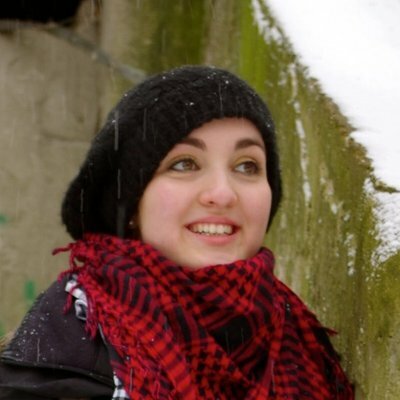 Also, my teeth got significantly whiter and they were so much cleaner. When I went to the dentist shortly after, she told me to keep doing what I was doing because my teeth were, in her words, in perfect condition, minus the cavities I’d managed to get when I was a kid. Though even those are improving between oil-pulling and the change in toothpaste/powder. Small glass or plastic jar: If you’re going to use green clay avoid using a metal pot, or even a metal lid unless it has a card buffer between it and the powder. The reason for this is because it’s thought that the metal reacts with green clay and will reduce how effective it is, so if you can, avoid metal. Green clay: I bought mine on Amazon years ago (I got a big bag) but you can sometimes find it in pharmacies or some natural health shops. If you live in France you’ll almost definitely find some in a pharmacy. 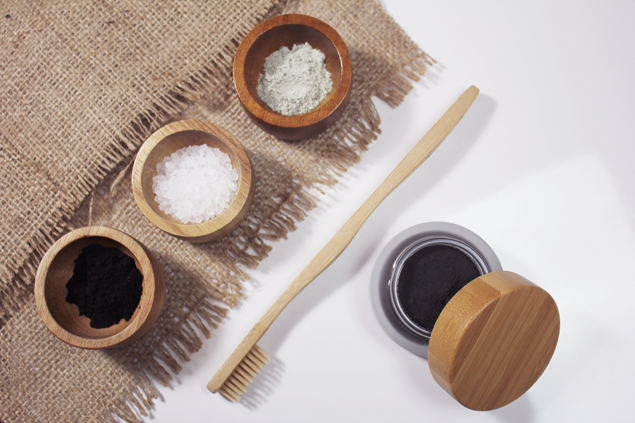 Activated Charcoal: You can just crush up medicinal charcoal tablets if that’s all you have, but be careful as some brands put a sugar coating on their tablets to make them taste nicer. Sea Salt: I use the regular sea salt you can buy in Aldi, crush it into a powder and mix it all in. If you can always go for unrefined sea salt. There are a few reasons I used salt in my mix. It tastes better with it. It is a natural disinfectant, and it briefly encourages an alkaline environment in your mouth, which is much better for the enamel on your teeth, and makes it hard for bad bacteria to survive in your mouth. 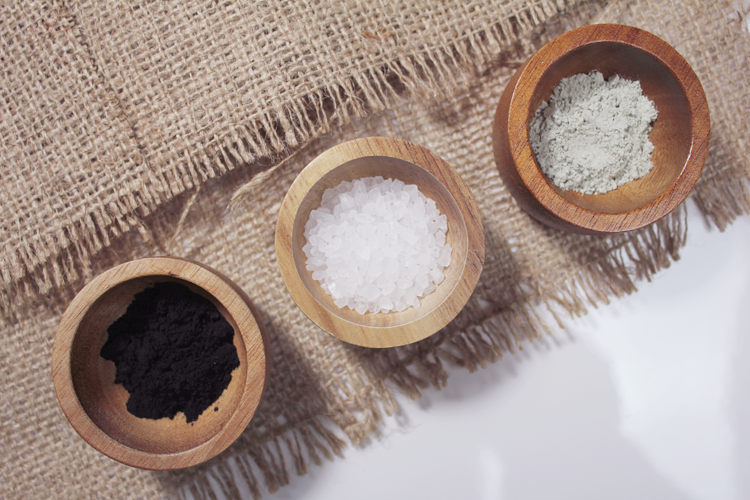 I wanted to use these ingredients for the following reasons: Green clay is an incredibly powerful detoxer and acts like a sponge drawing out rubbish under the surface it’s on. If you’ve ever tried a face mask which is primarily green clay you know what I mean when I talk about it pulling the rubbish out. It’s also minerally very rich, which can hardly be a bad thing since the gums are highly absorbent. As for the charcoal, while it might seem counterintuitive to use a pure black powder to whiten teeth, I noticed the difference after the first try. Some people debate how effective it is and say it’s just a marketing myth, but even if it is, I also like it because it’s anti-fungal, anti-odor, anti-viral, and antibacterial properties. They’re all properties I’d quite like my tooth powder to have. Especially if I’ve overdosed on garlic bread. Depending on the size of the jarl you’re using the ratio I normally use is 2/5’s charcoal, 2/5’s green clay and 1/5 sea salt. Mix it together (it’s generally advised to avoid using anything metal like a spoon if you’re using green clay), and that’s it. Simple. If you haven’t used a clay-based toothpaste before it can be a little strange and drying. What I do is dampen the toothbrush, dip it into the pot and then brush my teeth. Yes, you will briefly look like patient zero while doing this, and I did get a strange look from my husband when he first saw me brushing my teeth, but once you’ve rinsed your teeth will be back to normal. One thing you have to be careful with is to always give your sink a good rinse afterward because the charcoal can stain the ceramic. Same goes for clothes. 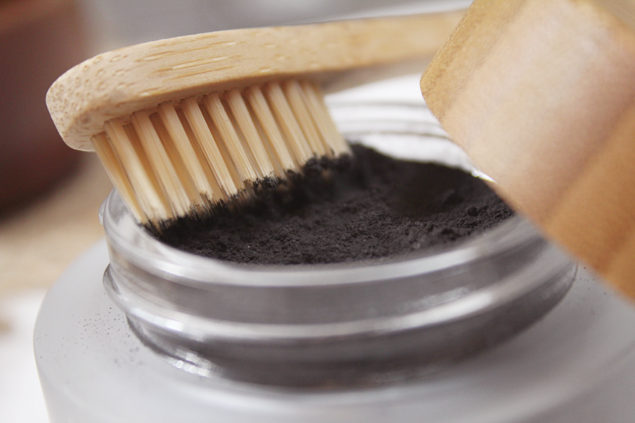 Some people like to add bicarbonate soda to their toothpaste for its tooth whitening effects, but personally, I find that charcoal is just as effective, and using bicarbonate every day can make my teeth sensitive again. If I’m going to use it, I’ll use it on its own as a one-off, not every day mixed into my toothpowder. Coconut oil is also another popular ingredient in homemade toothpowder, but I don’t like to add it because I really hate the texture. I’ll be fine if I’m using it for oil pulling, but I hate it mixed in with all the other ingredients. You can also add essential oils, but a word of warning, check that the oil is suitable to ingest and never put too much of it in. If you’re thinking of dabbling in essential oils I would recommend you get a good aromatherapy book like the Encyclopedia of Essential Oils. It’s not massively expensive and you can check things such as the active ingredients and safety data. Hi, I just had a quick question. You said that if you add oils to make sure it’s okay to ingest. 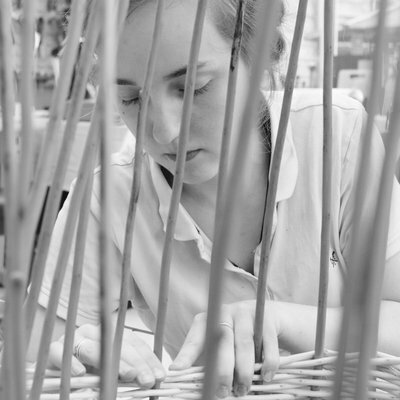 For the charcoal and green clay, do those need to be specific like food safe? Or just look for something that isn’t too fiddled with? Activate charcoal (or just a charcoal tablet) will be absolutely safe to ingest. The worst thing that might happen (and that’s if you actually eat a spoonful of the stuff) is you’ll get the worlds worst case of constipation. But for green clay make sure it’s food grade just in case. Small heads up though, it comes in brown paper packaging (which I prefer because I’m trying to cut down on disposable plastic as much as possible) but it does/did have a tendency to rip easily, so now I keep it in a glass jar instead.